On March 13, 2013 a new Pope was elected to become the spiritual leader of more than 1.3 billion Catholics worldwide. From the moment he walked onto the balcony of St. Peter’s Basilica, Pope Francis began to take the whole world by storm with his humble personality and his passionate message of love and mercy. Pope Francis in His Own Words is a documentary that brings together, for the first time, the words of Pope Francis to show the life experiences that led him to discover God’s mission for his life and that helped shape what is most important to him— the education and formation received and fostered in the family; the physical and spiritual care for all people, especially the poor; and the need for a deep faith and trust in God. Get to know the real Pope Francis, through his own words, as we follow him from his early years in Argentina, to his call to the priesthood, and to his election as Pope. By getting to know the real Pope Francis we see how the Holy Spirit chose him for this era to teach us the value of what it means to be true Christians. 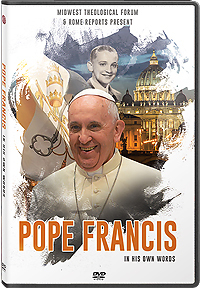 Pope Francis in His Own Words is a production of Rome Reports and Midwest Theological Forum in collaboration with the St. Josemaria Institute. Audio and subtitles in English and Spanish. All images are copyrighted. Full or partial use in print, broadcast or web is prohibited without proper authorization in writing from Midwest Theological Forum.